In Key 1, a professor writes a complex equation on the chalkboard. 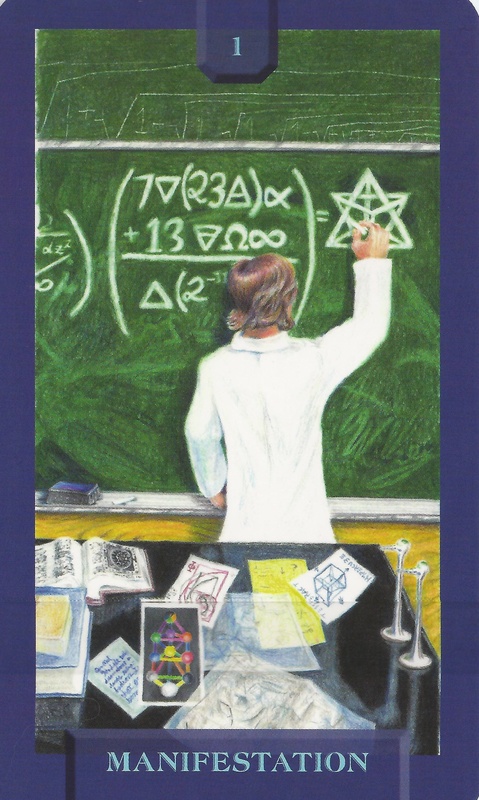 The equation includes the magical symbols for fire, water, air, earth, infinity and the merkaba. The elements of nature give us the physical structure necessary for life. The merkaba offers us the link to the Divine. It depicts two interlocking pyramids, one facing up and one facing down. The only things to do are actively and consciously participate in harmony with the Universe to have whatever is desired. As the infinity sign or lemniscate over his head suggests, there are no limits. The professor’s white lab coat indicates the purity of his intent. The green board represents the growth he is capable of achieving. The position of his hands reinforce the “as above, so below” symbolism of the merkaba, a vehicle for transformation. The number 1 represents the self, where the power of creation resides.